If you already have or are thinking about taking out home contents insurance you might have wondered whether or not your items are covered against accidental pet damage. This guide explains how you can insure your home against damage caused by your pets and what home insurance doesn’t cover, as well as what to do if your home is damaged by other animals and insects. You may also consider pet insurance to cover accidental damage caused by your pets to someone else’s property. Read on to find out more and learn some tips to help prevent your pets from causing any damage at home. What is pet damage home insurance? Pet damage home insurance is essentially the ‘accidental damage’ aspect of a home contents insurance policy. When you take out home contents insurance you will probably want it to include cover for accidental damage. Our guide to accidental damage home insurance explains more. This isn’t always included as standard, so you will likely need to pay a little extra to have accidental damage included. However, some electronics such as TVs and computers could be covered as standard, so double check the terms and conditions of your contents insurance policy. Accidental damage home insurance covers those one-off instances where you accidentally knock your TV off the stand, drop a vase, or spill red wine on the carpet. Your insurer would then replace the accidentally broken or ruined item for you. It essentially covers accidents in the home, but there are many things it won’t cover, and unluckily for pet owners, most pet damage is not included in accidental damage cover. If your young child accidentally breaks a valuable in the home then your accidental damage insurance is likely to cover it, but if your cat or dog does the same, most insurers will not pay out. Accidental damage home insurance doesn’t cover wear and tear or poor workmanship either. This means that if a chair breaks after someone sits in it but it’s been there for 20 years the insurer is likely to take the view that it was due to wear and tear. Some insurers may consider protecting your home against pet damage so it’s worth comparing home insurance quotes, but if they do it will come at an extra cost. If you have pets but you don’t have young children and you’re generally not accident-prone or have many parties at home, then you may find that accidental damage home insurance is not necessary. Besides there are some things you can do to help keep your pets from damaging items around the home – read on to find out more. What is accidental damage pet insurance? 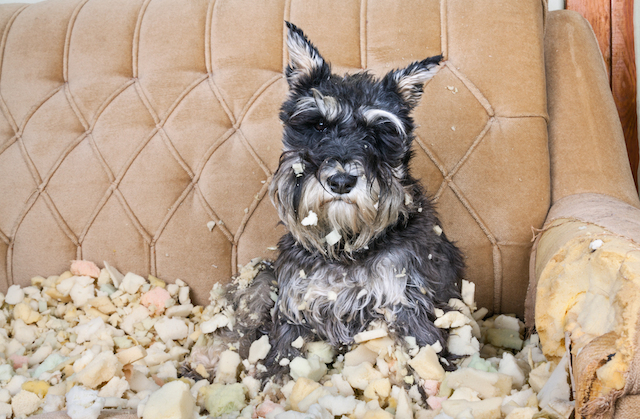 Pets’ behaviour can be unpredictable so insurers are unlikely to insure your home against accidental pet damage. They’re also unable to assess how well your pet has been trained so the risk of insuring your home is difficult to gauge. However, you can find pet insurance designed to protect you if your pet accidentally causes damage to another person’s property. For example, if your cat scratches someone else’s sofa and the homeowner makes you pay for the cost of the repair, your accidental damage pet insurance would be able to cover it. Like the accidental home insurance cover this protection comes at an extra premium and still has many exclusions so it may not always be worth it. For example, if your dog relieves itself on someone else’s sofa this accidental damage is unlikely to be covered by insurers. The same goes for scenarios where your pet is being looked after by a friend or relative. It’s important to read over the terms and conditions of your policy before agreeing to the insurance deal as you might be surprised by some of the exclusions. Your accidental damage home insurance cover is likely to protect you against uninvited animals causing damage. For example, if the next door neighbour’s cat sneaked in through a window and knocked over a valuable item and broke it, then you should be able to make a claim under your accidental damage contents insurance. If you have buildings insurance, which covers the property rather than the contents, then you might be covered against things like a bird flying into a window and cracking it. All of these aspects may not be covered under every accidental damage policy and could come at an extra fee so be sure to double check the terms of the policy first. Unfortunately, your own pets causing accidental damage in your own home is unlikely to be covered so you may want to find other ways to help keep them from causing any damage at home. Taking the time and effort to properly train your pets is the best and first step in preventing your pets from causing any damage at home. However, accidents can and generally do happen no matter how much you prepare. Pets like cats and dogs are often more restless and likely to cause damage when they’re bored and under stimulated. Playing games with them and treating them for good behaviour can help keep them content. For cats, you will probably want to keep them from scratching furniture, so you could get repellent spray for areas you want them to stay clear of and get them their own bed and scratching post. Search online for a home insurance deal that can cover your contents against all kinds of accidental damage.